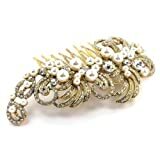 A charming vintage style hair comb with clusters of crystals and pearls on a gold tone metal finish comb. This hair comb is perfect for weddings, proms and other special occasions. Bride Boutique are one of Amazon’s top retailers for jewellery, hair accessories and gifts. Visit our Amazon store front now.